Stockings have been a fundamental part of Christmas traditions for centuries. Whenever St. Nicholas swoops by a house, he never forgets to fill the stockings with care. The legend of Christmas stockings began with dear old St. Nicholas slipping down a family’s chimney and filling three girls’ socks, which were naturally hung by the fire, with gold coins and golden orbs. While we can’t compete with St. Nick’s golden splendor, we can give our kids, friends and family lovely surprises in their stockings. 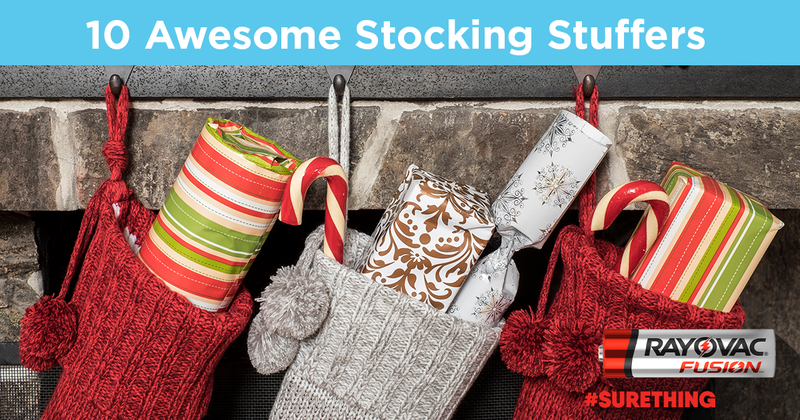 Below we’ve compiled a list of safe, science-friendly stocking stuffers for kids. Some kids love to read, but for others it can be tricky to get them involved, especially when the stories seem dull. But what does nearly every kid love? Animals, of course, and really cool animals like elephants and penguins at that. Getting them a subscription to a wildlife magazine like ZooBooks™ or National Geographic Kids™ can invigorate their love of reading and the natural world. When your child begins reading the new magazines you subscribed them to, you can make it more fun by encouraging them to read in a fort with a light source. RAYOVAC® virtually indestructible headlamps work as excellent reading lights during camping trips or long car rides. Plus, they are a great light source for hiking or snowshoeing in the evening. Sunprints® are a nifty science stocking stuffer for your young, inspiring artist. The concept is simple: you place a flower petal, toy or another small object on the Sunprint paper and then place both objects in the sun. Let them sit for a few hours, and then rinse the paper in water. Afterward, you’ll get the shadow imprint of the object on the paper! It works a lot like developing a photo, but with light instead of darkness. You can find Sunprint kits online. This is a simple, cute idea to bring your family closer together and let the kids feel like they have a voice in the family activities each month. Plan out 12 family activities each month and write them down on individual notecards. Afterward, place the ideas in unique envelopes and let your kids pick one envelope each month to choose the family activity. The RAYOVAC® Power Protect is an excellent portable charger with a built-in personal safety alarm. Simply pull the ring from the charger itself and a siren erupts that is audible from 200 yards away*. It’s the perfect peace-of-mind gift for any kids who walk to school or friends who love to jog at night. *varies by geography and environmental conditions. Putty is a timeless toy that sparks imagination and creativity. The new variants even change colors based on body temperature! Start a competition to see who can mold the best animal. Winner gets extra whipped cream in their hot cocoa! Some kids simply love a good mystery, and a spy pen feeds that adoration. The pens write in invisible ink which is revealed with the pen’s built-in UV light. Consider using the pen to hide clues during a scavenger hunt. Stories about monsters and heroes are pretty darn cool when you’re a kid. And you know what else is pretty cool? Producing shadow puppet shows with your child to encourage exploring their inner thespian. Your local library will likely have a beginner’s guide to hand shadows, and we sell virtually-indestructible flashlights to illuminate the performance. Bubble chemistry (yes, this is a thing) has come a long way since blowing soap bubbles from a plastic container was a novelty. Look for a bubbly concoction called touchable bubbles, which is non-toxic and washable. It lets your kids (and you) blow resilient bubbles that are strong enough to resist easily bursting. You can even stack them on a table and make bubble castles! This stocking stuffer is on the expensive side, but it’s a really neat idea for teenagers (or office parties). A smartphone projector allows you to project whatever is on your phone’s screen to a blank wall or large white canvas. It’s a great option for at-home picnics, movies in the backyard and even your holiday parties! RAYOVAC® is a trademark of Spectrum Brands, Inc. All other marks are the property of their respective owners.